WHO WE ARE in PORTUGAL? … is one of a sustainable society — one in which individuals, communities, businesses and institutions thrive within nature’s limits. …is to accelerate the transition to a sustainable society. ..
Our theory of change begins with the firm belief that it is possible to create a thriving human society within nature’s limits. Natural and social sciences tell us the system conditions for sustainability. These conditions, or principles, are the design constraints for a rigorous and clear articulation of a sustainable society. We also know that the transition to sustainability will be (and is being) led by innovators who create different ways of meeting human needs within the new design constraints and by the early adopters of their innovations. While most action and investment to spur the transition will take place within the context of institutions, organizations cannot themselves be sustainable in an unsustainable society. In the end, it is systems that must become sustainable. We believe that the transition to a sustainable society begins by increasing awareness, commitment and competence in individuals to understand what sustainability means and to integrate sustainability principles into all of their decision-making and actions (see green spiral in image). As these qualities develop in individuals, they begin to collaborate with others and ultimately to begin to build awareness, commitment and competence within their own organizations and communities (see blue spiral in image). As organizations advance on their sustainability journeys, they eventually face challenges that are systemic in nature and require them to collaborate with other organizations and sectors. 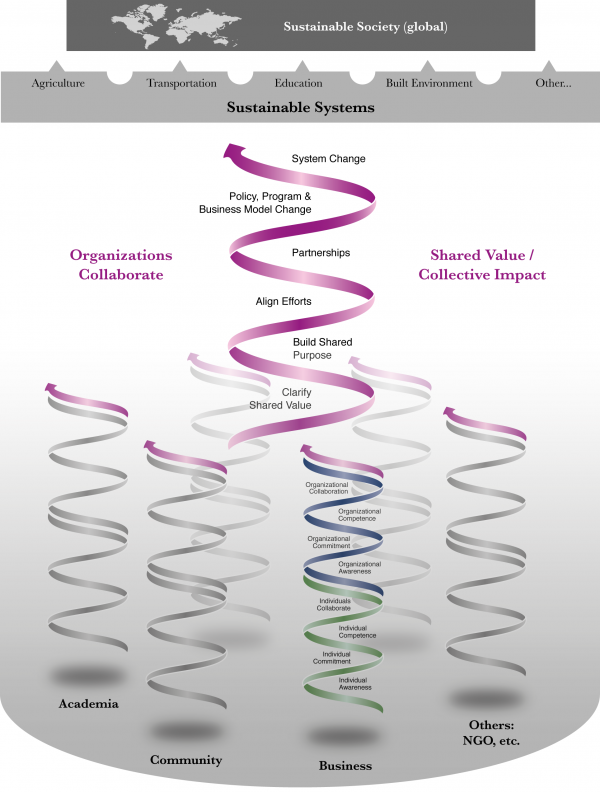 Sustainable systems can only result from systems-changing innovations, policies and partnerships arising from organizations and sectors collaborating effectively (see purple spiral in image). Our work helps foster creativity, hope, and ambition at every level of the spirals. 25OneCommunity, 251 Bank St. 5th fl.